Studying Torah and vibrant, musical Kabbalat Shabbat services begin our weekend together. Friday continues with dinner, singing, and study sessions. 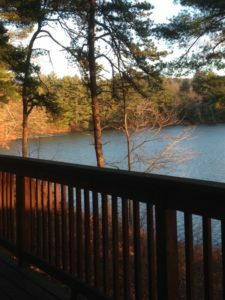 Participate in spirited prayer, or contemplative meditation, take walks in the woods or at the lake, study accessible texts, learn and sing new songs, stretch your body and your mind with engaging study and discussion all weekend long. The retreat ends after lunch on Sunday. Camp Ramah in New England is located just outside of Palmer, MA, a few miles north of exit 8 off the Mass. Turnpike. The camp is about 75 minutes from Boston, MA or Hartford, CT; 90 minutes from Albany, NY, or Providence RI; and about 3 hours from New York City. Camp Ramah has an indoor recreation facility, a lake, wooded walking paths, informal lounges, seminar rooms, a state-of-the-art Beit Midrash complex, a Judaic library, and a prayer space. Accommodations are simple, comfortable, and fully winterized. Single rooms and “motel-style” rooms are available. Meals are kosher, with vegetarian options. Towels, linens, and blankets are provided. Saturday Night Entertainment features a talent show, group singing led by Josh Schreiber Shalem and Lauren Rose, and joined by our musical attendees in an open-ended jam session. Bring copies of Rise Up Singing! 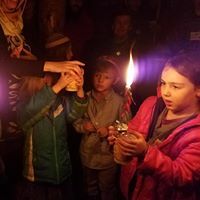 Participants from the 413 Area Code can attend for 50% off thanks to a Jewish Family Camp grant available from the Harold Grinspoon Foundation. 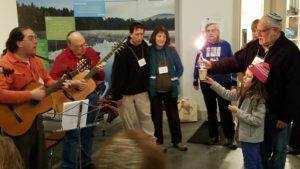 Visit https://hgf.org/grants-awards/jewish-family-camps or contact the retreat co-chairs for information before registering. To register, complete this form and send it, with your check, payable to NHC New England Retreat, c/o Steve Lewis, 162 Hampshire St, #1L, Cambridge, MA 02139. We cannot accept on-site registrations. Please return your form by November 21 to avoid the late fee. What compels Judah to stand forward at the opening of this week’s Torah reading, VaYigash? What gives him the moral courage to present himself as guarantor for his brother, Benjamin? This class traces the transformation of Judah from the dastardly brother, so eager to sell Joseph into slavery, to the noble soul who places himself on the line for another–a change that pivots on his encounter with his daughter-in-law, Tamar, in Genesis 38. We will compare different traditions about what happened in the Garden of Eden, from the Quran to Neil Gaiman. We will then discuss how the way we tell the stories affects our lives. We’ll consider spiritual moments we’ve had on bicycles, and look at writings and other tools which Jewishly frame the spirituality of bicycling. Let’s daydream together about a future collaborative effort/product arising from this sharing. Noise, stress, and hurriedness are part of our daily lives. How can the use of the Mikveh grant us the time and the space for solitude, for gratitude and for true mindfulness. Please join us as we explore the mindfulness of Mikveh. We’ll explore how a weekly, monthly or occasional visit to the Mikveh can provide us with time to reflect and contemplate in an atmosphere that supports peace and tranquility. What is the Jewish experience of refuge – both giving and receiving? In this session, we will do a text study on refuge, followed by short participatory play reading based on a real-life event. We will explore implications for current social justice issues such as the sanctuary movement. We will read several totally X-rated compromising texts from the Torah and the Prophets. English versions will be provided, and Hebrew knowledge is not required. We will look at biblical texts containing this word to discover some surprising additional meanings and some familiar associated words that gives this word special significance. What is the point of doing Jewish ritual actions? Answers vary, depending on philosophy and theology. Consider the notion of mitzvot as potent little packets of communication, which when opened, can steer us toward a good life. Let’s look at ritual mitzvot as technology that can support us through times easy and hard, without re-inventing the wheel — Existing Jewish Technology. Chanting Torah, Haftarah or other parts of the Bible can function not only to fulfill our tradition to recite sacred texts with their ritual cantillation, but also to provide important punctuation and emphasis, and as a fun, inspiring experience for the reader and the congregation. With coaching and partner-work, come see how to hone and spice up your reading. Got friends? From ancient to contemporary times, Rabbis and Jewish scholars have been concerned about the roles and interactions associated with these important relationships. We will explore intriguing Talmudic and other ancient Rabbinical commentaries on comradery. Using these perspectives, we will study, discuss, and debate current controversies in the Jewish community regarding friendship. What makes a verse memorable? How are memorable verses relevant to us? In this session, we will examine and discuss portions of the “Memorable Verses in the Torah” book that Joe recently published (www.memorableverses.com). Explore the recently revised Hallel prayer done by Havurat Shalom in Somerville, MA. Find out what issues inspired these changes and why the changes were made. Contemplative and Devotional chanting can enhance our psycho-spiritual fitness, especially when shared whole-heartedly in a group. Chants can use traditional texts or tunes as well as new ones. They can be calming, inspirational and vitalizing. They can be spiritually and physically oriented. Come explore some chants as vehicles for psycho-spiritual vitality. Aldo Leopold, a founder of deep ecology, adjured us to become “plain citizens” of the land community, rather than rulers over it. Discover Jewish foundations for a new ethics of animal rights, the environment, and the question of how human beings can become good citizens of our ecological community. We will see how a covenantal ethic of Life and a new understanding of God’s image can be established through the Torah, Maimonides, Buber, and the Kabbalah, and envision how the Abrahamic traditions can help transform human power into a gift we offer in service to the world. We will examine passages from the Siddur, and from Rabbinic and Hasidic teachings, and physically explore concepts we have encountered through the process of Feldenkrais® Awareness Through Movement® and personal reflection. We will make a silk object that will be ready to take home in an hour! You can make a Hallah Cover or Mizrach or a Tichel if you prefer. Materials fee $5. Ahavah Rabbah is the last b’rachah before the Shma in the shacharit service. It appears to describe the ‘life of the faithful’. Does it? Do we agnostics and hippies have any relation to this prayer? Rachel Adelman Assistant Professor of Hebrew Bible in the rabbinical program at Hebrew College in Boston. Miriam Diamond is a popular Jewish educator from Brookline, MA. She has taught at previous NHC winter retreats, Limmud Boston, and Limmud UK. Her play, Out of the Loop, has been performed and read in communities across New England and at Limmud UK. Sue Gulack is a chaplain, story teller and crafter with over 40 years in the Havurah movement, who lives in Albany, NY. Amy Loewenthal serves as the rabbi of Congregation Ahavas Achim in Keene, NH. She loves Hebrew, bicycling, singing, and mangoes. Joe Rosenstein is the author of Siddur Eit Ratzon and Machzor Eit Ratzon (newsiddur.org), and has just published “Memorable verses in the Torah” (www.memorableverses.com). He is a former Chair of both the NHC and the NHC Institute. He recently retired from Rutgers University where he taught mathematics for 48 years. He and his wife will soon celebrate their 50th anniversary with their 11 grandchildren. Josh Schreiber Shalem is an active member of Havurat Shalom in Somerville, MA, a popular NHC teacher, a certified teacher of the Feldenkrais Method® of Somatic Education, and performing musician. Leann Shamash is a teacher, mentor, photographer, shpiel director and gardener. She is a Mikveh Guide and Educator at Mayyim Hayyim, the community mikveh in Newton, MA. She worked as the education director of Congregation Beth Elohim in Acton and Temple Sinai in Brookline and taught for years at a day school in Lowell. David Seidenberg is a Rabbi and author of “Kabbalah and Ecology: God’s Image in the More-Than-Human World” and creator of neohasid.org. Jonah Steinberg is the executive director of Harvard Hillel. Carl Woolf is a long-time NHC teacher. His interests include music-making, davening, movement and text-study. By day he engineers software.